The efforts of the delegates at the annual National Model United Nations conference hold in March 2017 in New York City were prosperous. The joint-delegation from Westfälische Hochschule (WHS) in cooperation with Kobe university of foreign studies (KCUFS) was recognized as a honorable mentioned delegation at NMUN 2017. For a period of five days 24 students (18x WHS, 6x KCUFS) made their way to Midtown Manhattan in order to represent delegates from the Republic of Korea. A massive knowledge on substantive matters were for this role as important as the competence to act by United Nations rules and procedures during the UN conferences in several committees from the 19th to the 23th of March 2017. The exhausting preperation paved the way to successfull days with diplomatic negotiations, well-considered cooperations with other UN member states and the hard work on voteable resolutions adressing global issues. At the end their ambitions were rewarded with an award certificating the great work of the multi-national students. The NCAA, host of NMUN, was recognizing the delegation of both universities as an honorable mentioned delegation. 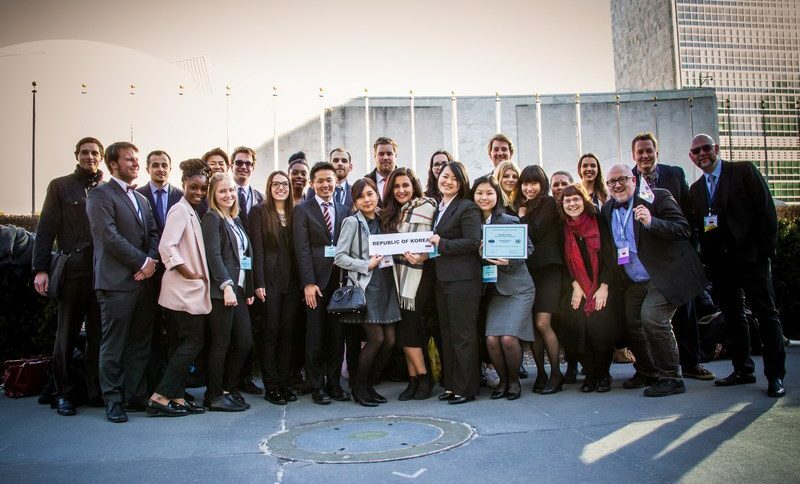 At the last day the conference and contribution of the more than 3.000 students from over 30 nations were accredited by long applause in the General Assembly Hall within the United Nations Headquarters in New York City. Keynote speaker Mr. D. Stephen Mathias, himself Secretary-General at NMUN 1977 and working actually for the UN today, was calling upon spreading the word about Nation Model United Nations all over the world when returning home, before the present delegates voted in favor for the adjourning of the meeting until March 2018. ← Previous Previous post: National Model United Nations 2017 is in session! Berlin and GerMUN: Our final steps to NMUN2019!